Calcium signaling in health and disease: cardiac arrhythmias and beyond. Calcium ions play crucial roles in our bodies: they shape part of the cardiac action potential, mediate contraction of both cardiac and skeletal muscle, allow for the release of neurotransmitter and hormones, and regulate gene transcription, cell motility and much more. Impairment of normal Ca2+ entry can lead to devastating conditions. Ca2+ enters the cytoplasm through specialized ion channels. Our lab is dedicated to understanding how such channels work in both native and diseased states. Our main focus is on several types of Ca2+ selective channels, including ryanodine receptors (RyRs), and on channels whose activity is modulated by Ca2+, including voltage-gated sodium channels (NaVs). Both NaVs and RyRs are dynamic proteins that can change their state depending on various input signals. 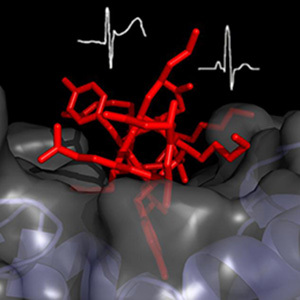 We integrate X-ray crystallography with electrophysiology and various biophysical techniques to understand their molecular mechanisms. RyRs are channels that release Ca2+ from the sarcoplasmic/endoplasmic reticulum. In cardiac muscle, the activation of voltage-gated calcium channels (CaVs) evokes an increase in cytoplasmic Ca2+ concentration. The RyR detects the increase and releases more Ca2+ into the cytoplasm, thus ‘amplifying’ the signal. In skeletal muscle, CaVs and RyRs are thought to communicate directly through protein-protein interactions. Mutations in RyRs are linked to several genetic diseases. Mutations in the skeletal muscle isoform (RyR1) can lead to central core disease (CCD) and malignant hyperthermia (MH), one of the major causes of death due to use of halogenated anaesthetics. Mutations in the cardiac isoform (RyR2) may result in catecholamineric polymorphic ventricular tachycardia (CPVT) and arrhythmogenic right ventrical dysplasia type 2 (ARVD2), two devastating conditions that lead to cardiac arrhythmias and may result in sudden cardiac death. RyRs are the largest ion channels currently known (with sizes up to 2.2MDa), built up by 4 identical subunits. They are regulated by a wide array of small molecules and auxiliary proteins (calmodulin, FKBP, kinases, phosphatases, …). We currently know very little about the RyR atomic structure. We have determined the crystal structures of a disease ‘hot spot’ and the target domain for several kinases, together covering ~15% of the entire protein. Together with available cryo-electron microscopy reconstructions, we show that disease mutations affect several domain-domain interactions. By weakening the contacts, it allows the RyR to open easier, leading to leakage of calcium ions into the cytoplasm. One major goal is to understand the mechanisms that underlie RyR function in normal and diseased states. 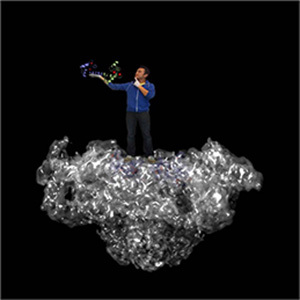 We aim to generate more crystal structures of important domains and their interactions with auxiliary proteins. These structures are then used to guide functional experiments in planar lipid bilayers. Voltage-gated sodium channels (NaVs) are able to detect differences in voltage across the plasma membrane: when an excitable cell depolarizes to a sufficient level, they open and allow Na+ to enter. Their dysfunction leads to various severe and often lethal genetic diseases, and they form the targets for many drugs to treat cardiovascular diseases and pain. Despite their importance, we still lack a profound insight into how NaVs work. This is due, in part, to the limited amount of high-resolution data describing their precise architecture. One property of NaVs is their ‘inactivation’, a process by which the channels shut down. This is thought to occur via a cytoplasmic segment that acts as a plug. Many channels can already be inactivated prior to the depolarization of the membrane, which means they are not available for conducting Na+. Modulating the process of inactivation is therefore a key mechanism by which the channels can be regulated. Ca2+ ions can decrease the amount of inactivated channels. This is accomplished by the binding of Calmodulin, a ubiquitous calcium sensing protein, to the so-called inactivation gate of the channel. We aim to elucidate the mechanism by which calmodulin can alter inactivation of the voltage-gated sodium channels. Kimlicka L, Tung C-C, Carlsson AC, Lobo PA, Yuchi Z, Van Petegem F (2013) The cardiac Ryanodine Receptor N-terminal region contains an anion binding site that is targeted by disease mutations. Structure 21, 1-10. Disease Mutations in the Ryanodine Receptor Central Region: Crystal Structures of a Phosphorylation Hot Spot Domain, Structure 20, 1201-1211.